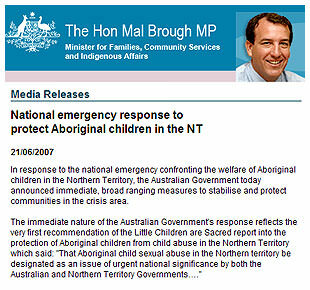 The Commonwealth Parliament has now passed five bills described as the national emergency response to child sexual abuse on Aboriginal communities in the Northern Territory. It was law making at Canberra’s worst. The 600 page bills were introduced and passed through the House of Representatives in less than a day. They were subject to just a one-day committee review process in the Senate. When government does not have recourse to an elected Aboriginal consultative body, when the government controls the Senate, and when there is an election in the air with an Opposition that refuses to be wedged on non-economic policy issues, there is little prospect of close parliamentary scrutiny of bold new policy proposals for Aboriginal well-being emanating from Canberra. A central plank of the original proposal was to ensure “compulsory health checks for all Aboriginal children to identify and treat health problems and any effects of abuse.” The initial announcement of the government initiative was so rushed that it took only the most rudimentary consultation with the medical profession to highlight how unethical, unworkable and harmful compulsory health checks would be. The government claimed to be acting urgently, without consultation with the NT government and NT Aboriginal leaders, in response to the NT report ‘Little Children are Sacred’. And yet the authors of that report had said, “In the first recommendation, we have specifically referred to the critical importance of governments committing to genuine consultation with Aboriginal people in designing initiatives for Aboriginal communities. ” The authors of the report were not invited to give evidence to the Senate committee even though they travelled to Canberra and were in Parliament House. Those concerned for the well-being of abused children, but not prepared to take the Commonwealth government’s intervention on trust, asked for credible explanations why it was necessary for the Commonwealth to acquire land leases over Aboriginal community lands for five years. Everyone knew that compulsory acquisition of Aboriginal land without reason and without consultation would engender mistrust in those local Aboriginal leaders whose cooperation would be essential if any Canberra initiative were to succeed. We are now entering a new phase in Aboriginal policy. It is not just about protecting the children. Canberra has decided to try a new way of involving Aborigines in remote communities in the real economy, and a new way of delivering health, education and law and order services. The real policy work for this new era will commence in earnest in 2008, no matter which party is in power in Canberra. Before the 1960s, Aborigines participated in the north Australian economy without land rights, without self-determination, and without equal wages. The second phase of participation was built upon equal wages with welfare taking up the shortfall, and land rights, with remote communities and outstations being established without a real economy or access to the usual government services. With the Community Development Employment Program (CDEP), 8,000 Aborigines on these NT communities have been paid the equivalent of the dole for working a few days a week. In this new third phase, 2,000 of these people will be paid real wages for real work. And the rest? They will have to seek employment and job training like other Australians. Where? How? There will be two classes of Aborigines in remote Australia — those with jobs and those with no prospect of employment or training in their home communities. 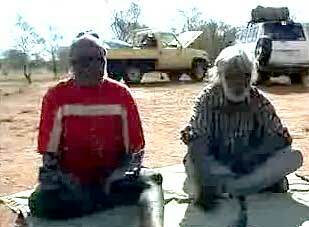 In the last 20 years, the Aboriginal population in NT remote communities has grown by approximately 40 per cent. 72 per cent of the Territory’s Aboriginal population lives on Aboriginal land outside major towns. 54 per cent of these communities do not have a local health clinic and 94 per cent are without preschools. Here now is the problem which has been escalating since land rights were first granted and recognised. No matter what the politicians say at a time of emergency, it is not cost effective to deliver the full panoply of human services to small remote communities. The acute problem now is that the children in such communities cannot be guaranteed protection from sexual predators by either the state or by their own community members. Once the dust settles on the present political flurry, there will have to be a negotiated process for determining the viability of outstations and small remote communities. Taxpayers will not stand for delivering the full panoply of services to every community, no matter how small. There will be a need for detailed government cooperation with groups like the Coalition of Aboriginal Organisations. Public servants can be sent to remote communities to deliver services; police can be sent to enforce the law; but there will be no long-term satisfaction for anyone in commissioning outsiders to live in communities simply to monitor family obligations before quarantining welfare payments. This third phase will cost big money and will entail significant relocation of the Aboriginal population in northern Australia. Real jobs and real services don’t come cheap in remote Australia, regardless of the community’s racial identity. Frank Brennan SJ AO is a professor of law in the Institute of Legal Studies at the Australian Catholic University, professor of human rights and social justice at the University of Notre Dame, and Professorial Visiting Fellow, Faculty of Law, University of NSW. When suffragette Lady Constance Lytton got herself banged up and forcibly fed in Walton Gaol in 1910, she was there 'disguised as a lower-class woman, Jane Warton' and not as Lady Constance. Why did she disguise her identity? Because she knew that as Lady Constance she would never have gone to gaol for her illegal protests and an attempt would have been made to duchess her back into the aristocratic fold. What has this got to do with Professor Frank Brennan's article? If Frank were to put aside his academic endeavours and take on the role as of someone truly committed, by going to live in one of the aborigianl communities of which he speaks and LIVE there; not for a week or a month or six months but for a whole year, using his great intellect and energy to improve peoples lives in that community, that would be a genuinely prophetic act. In the last century it was the Jesuits who abandoned the Daly River tribes . Perhaps Jesuit Frank, like Lady Constance, could do something incognito to redress that wrong. For the past 12 months i have been very interested in working in NT in remote communities. I'm currently living in tas completing both of my certificate 4s in community services and welfare and community development. I'm not sure how to find information about employment in remote areas. I would love some advice as i am passionate about what i want to do. Thanks. I am living in a remote NT community far from the maddening crowds of suburbia. I can only but support Franks' analysis of the human disecreation that continues to unfold under the guise of NTER. It is an act of shamefulness being foisted on a 60,000 year old living culture. White fulla cannot fix Black fulla problems unless they sit down and talk eye ball to eye ball with the traditional land owner and then it's not tamper proof.